The number of possible salmonella cases linked to popular pre-packaged salads has almost doubled in an outbreak that has hospitalised two people. The Department of Health and Human Services on Friday confirmed there had been 54 suspected cases of the Salmonella anatum strain associated with lettuce grown and packaged by Victorian company Tripod Farmers. The number of reports has risen dramatically since Thursday night, when authorities had only received 28 reports. 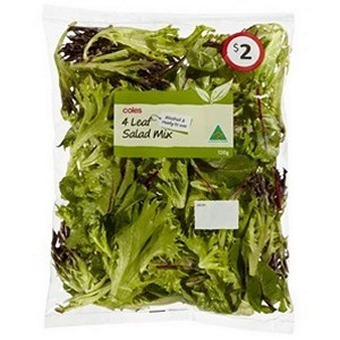 Fairfax Media has been inundated with emails from people all over Australia claiming to be affected by the pre-packaged lettuce. Retailers Lite n’ Easy and Aussie Farmers Direct have confirmed they have sold some of the affected products. It is sold at Coles, Woolworths, Bi-Lo and other grocers as Coles 4 Leaf Mix, Woolworths salad mix, SupaSalad Supamix and Wash N Toss salad mix. Products that have been added to the nationwide recall list on Friday are Woolworths Gourmet Mix, 100g, Supa Salad ALH, 1kg, Clear Film Blend, Clear Film Spinach and Clear Film Cos. The affected products have best-before dates leading up to and including February 14 and have been sold in all states and territories except for Tasmania and Western Australia. The health department identified the lettuce after recording an unusually high level of the Salmonella anatum strain infections and traced a number of those back to the products. “Normally we only see a handful of cases of this strain each year, but so far this year there have been 28 adult cases of Salmonella anatum – mostly adults – notified to the department,” the department’s senior medical adviser Dr Finn Romanes said. “As a result of following up the food histories of a number of people we have discovered a common source – the Tripod Farmers lettuce. Dr Romanes said two of the people affected by the outbreak had been hospitalised, and that the infection could be fatal for people with compromised immune systems, babies and elderly people. Given the prevalence of the products and their distribution through supermarkets, he said the cases known to date were likely to be the “tip of the iceberg”. “We do expect to see more cases,” he said. The 28 cases were mostly adults. No pregnant women had been affected so far and no deaths had been linked to the outbreak, he said. The health department became aware of the link between the outbreak and the bacteria at Tripod Farmers in Bacchus Marsh, in Melbourne’s outer-west, on Wednesday. Since then, the department has been working with the company on a recall of affected products, Dr Romanes said. The anatum strain of salmonella was uncommon and could be found in chicken and egg products. Fertilisers including affected chicken and eggs may have caused the bacteria to spread among salad vegetable crops, he said. Tripod Farmers managing director Frank Ruffo said he was “shocked” the department had detected salmonella in three product samples and that his company was racing to identify the source. “We are shocked at the test results because we put public safety first and foremost and comply with all Australian health and safety standards,” Mr Ruffo said in a statement. He said the company was family-owned and had a workforce of 400 people across its Victorian farms in Gippsland, Western Melbourne, Mildura and processing facility in Bacchus Marsh. “We have commenced a thorough investigation and will work with health authorities to ensure we get to the bottom of this,” Mr Ruffo said. The NSW Department of Primary Industries said there had been no reported cases of salmonella in NSW linked to the recalled products. The recall is not limited to Coles and Woolworths and will affect other grocers and businesses. Diet-food delivery service Lite n’ Easy has told its customers not to eat the salad component in its pre-made lunches and to seek medical attention if they had eaten them and felt unwell. Lite n’ Easy said it was replacing Tripod Farmers as its lettuce supplier. Lite n’ Easy head of nutrition Maryl-Ann Marshall said they were contacted by Tripod Farmers just after 4pm on Thursday to tell them that some of the lettuce they had supplied may be affected by the recall. “Once we received this advice, we immediately set about working out which salad batches may be affected and which customers received those salads,” Ms Marshall said. Ms Marshall said Lite n’ Easy customers in Western Australia were not affected by the recall as a different, local lettuce supplier was used in that state. “We would like to assure all of our customers that we have taken immediate steps to replace the lettuce supplier in question with a new supplier and that any salad meals in next week’s menu will not be affected by the current recall,” she said. Meanwhile, Aussie Farmers Direct has confirmed it sold some of the affected salad lines and was last night emailing a small group of affected customers. “We did sell some of the affected salad lines as well and we have directly emailed those customers who had purchased those products and alerted them to the recall,” Aussie Farmers Direct spokesman Jim Cooper told Fairfax Media. Dr Romanes said if people were unwell and concerned they should see their doctor and get a simple test for salmonella. The Food Standards Authority of Australia and New Zealand has issued a recall notice on its website. Coles said pre-packed lettuce with a use-by date of February 12 or later was safe to eat. On its website, Tripod Farmers say they are “considered Australia’s leading salad company” farming more than 800 hectares across Western Melbourne, Gippsland and the Sunraysia regions. The company says it supplies lettuce leaves and gourmet mixes to large and independent supermarkets across Australia and overseas, as well as to domestic wholesales markets in Melbourne, Sydney, Brisbane and Adelaide.